In today’s world where the strategy of customer obsession is a competitive imperative, more than ever sales leaders are expected to ensure that their sales force is delivering consistent levels of performance. However, increasing complexity in sales structure and rising volume of offerings make managing and selling especially challenging. Modern technologies provide sellers, sales managers, and sales leaders with access to ever-expanding volumes of information delivered from throughout the organization — but sales professionals are finding it challenging to integrate, disseminate, and utilize that information to drive sales results. 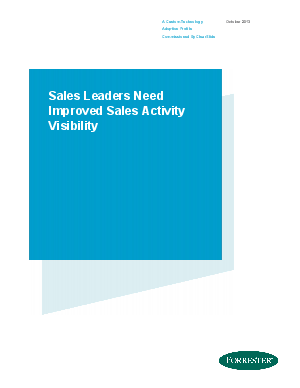 Many companies are investing in sales enablement technologies and hope to streamline content delivery, gain visibility into the activities of their reps, engage prospective customers more effectively, and drive productivity resulting in more closed deals.